Wusuraambya Airstrip shuts down for maintenance…..
Because the surface of the airstrip has become very rough due to water erosion, it became necessary to close it on August 5. Drainage ditches are needed along each side of the airstrip as well as addition maintenance. Since the airstrip closed, we have heard that the Wusuraambya people are working hard on the required maintenance. When Andrew goes in Sept. 24 he will fly in to a neighbouring airstrip and hike for about an hour (if the trail is dry) to get to our home. Please pray that people will stay motivated to complete all the necessary repairs so that the airstrip can be reopened soon. After nearly two months in the tribe for summer vacation, our children have begun another school year at Numonohi Christian Academy. Josh is now in middle school (grade7) and Dan, Ben and Heidi are in highschool, in grades 9, 10 and 12. Heidi is on the softball team and Ben is on the volleyball team. All four children enjoy interacting with friends. 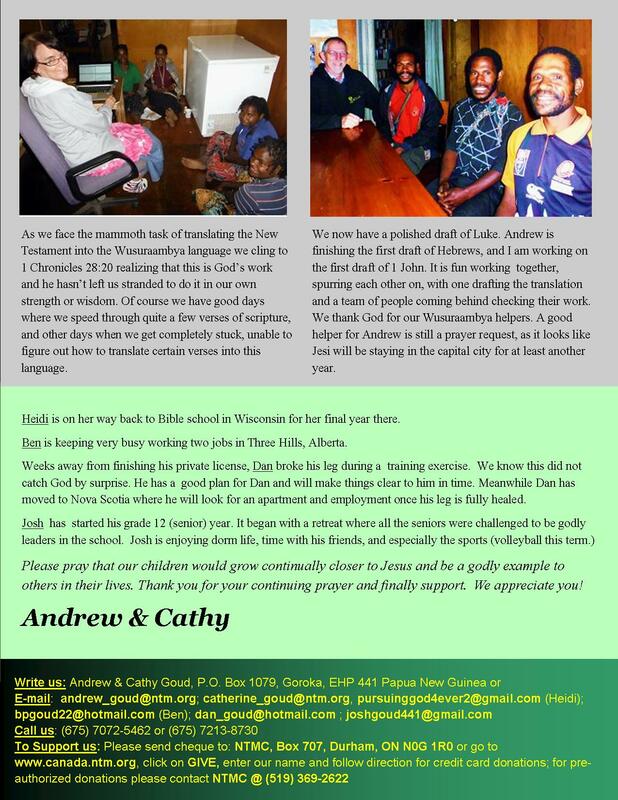 We thank the Lord for dedicated staff who seek to be a godly example to the children. Please pray for Heidi, Ben, Dan and Josh, as well as us as parents, that our love for our Lord would grow stronger each day. During these next two weeks the believers in Wusuraambya will be taught from Romans 12 concerning the aspect of giving their bodies to God as living sacrifices for Him to use as He desires. Pray for the believers as they discern what this really means. If we give our hands to God would we continue to use our hands to steal or play cards (gambling) or fight? No, God would not desire to use our hands in that way. If we give our mouths to God, would we say harsh words of hatred towards people who hurt us? No, God would rather use our mouths to speak the words of love contained in the Gospel. Pray that we would not only be teaching these thoughts to the believers but also have practical opportunities to teach our children how to apply these truths in their young lives. Pray too that we as a couple will noticeably apply God’s Word in our day-to-day lives. Several times a year groups of young people who wish to “check out” missions, come to the college-level missions program known as “Interface” here in PNG. (Click on this link to find out more: Interface PNG) As part of their program they visit a tribal location. The day they wanted to fly in, the weather was TERRIBLE with clouds right down to the ground! The team never did make it in the first day, and the second day there was only a window of time for them to get in before the clouds set in again. 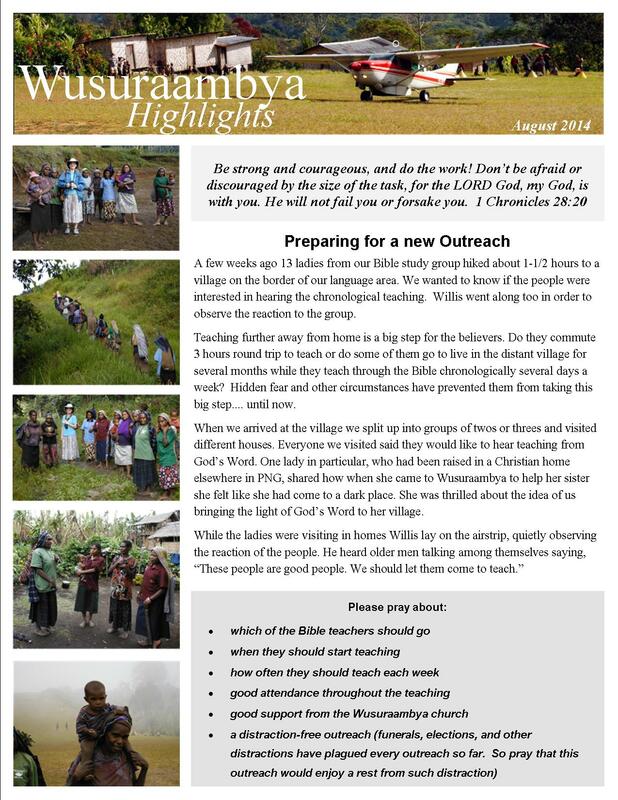 Despite having to slosh through the MUD, they had a wonderful time of fellowship with the Wusuraambya believers. It is only a short time now until Cathy and Heidi travel to Australia for Heidi’s jaw surgery. They will fly down on September 7th. Heidi has 4 pre-op appointments with the surgeon beginning on September 9th and the actual operation is scheduled for October 5th. They will stay for two weeks after the surgery for additional appointments before returning to PNG on Oct. 20. Please pray for Heidi as this will not be a pleasant experience, and for all of us as we are separated for 6 weeks. This weekend we had a visit from our former co-worker, Gary Piovesan, who left the field in 1995. 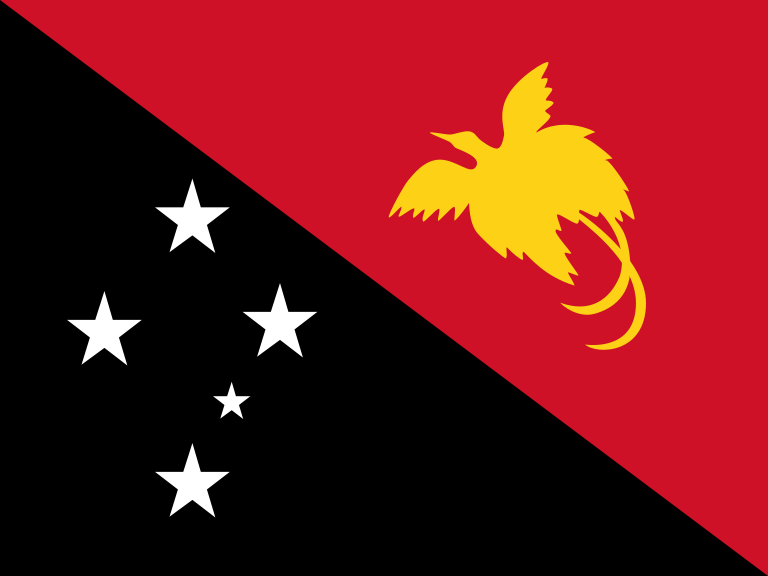 After 19 years of ministry in Papua New Guinea it had been depressing to see how little impact the Gospel had had on the Wusuraambya people back then. So when he visited the believers this weekend and listened to the many testimonies of God’s grace in Wusuraambya it was very encouraging for him. He spoke (in the Wusuraambya language after 14 years!) in church on Sunday, and again on Monday at a “mumu” (feast), encouraging the believers. It was a very special time. TRANSLATION CHECK ROMANS AND RUTH……. Today we finished another translation check of 4 more chapters of Romans and the book of Ruth. Ruth is Cathy’s 1st translation project and checked out very well. Her next project will be Titus. Last week I (Andrew) was also able to check Jesi and Josek’s progress with the book of Exodus. They are making good headway too. Another way that God has been answering prayer lately is in Jesi’s life. Jesi was having a hard time these past weeks because there was a lot of cultural pressure for him to marry a certai n girl whom he did not feel God was leading him to marry. He also did not want to be married right now so that he could focus completely on the translation work as well as the Bible teaching. During this past week I visited the tribe and spoke to the believers about marriage from both the Biblical and the cultural points of view. Using the example of Isaac, I pointed out that an arranged marriage can be a happy occasion when God is consulted. Thus we CAN follow God’s plan within the context of Wusuraambya culture, but the important thing is to truly wait upon God for the right person and the right time. In the end the believers all agreed that it would be wrong to force Jesi to marry this girl right now. Jesi was very happy and relieved when this was finally resolved. The kids finished their school year yesterday and are very happy to be off for the “summer” break. We’ll be flying back to the tribe next week and staying until the last week of July when school starts again. As of today Heidi is a SENIOR! In only ONE year she will be leaving the country she grew up in and going to start a new life in Canada. We mentioned in our last letter that Heidi would be having jaw surgery later this year. This has been a great adventure in faith. A few months ago this appeared to be a great impossibility. God has shown Himself strong in such a wonderful way. Firstly, our medical insurance will cover the cost of the surgery. Secondly, Cathy and Heidi have been offered free accomodation while they are in Australia. Thirdly, God has begun to provide funds towards the flight expenses as well as other expenses which will be incurred while they are there. We want to say THANK YOU to those of you whom God has nudged to be a part of seeing this need met in our lives. These miracles have been a faith-strengthening experience. Why do we ever doubt God?